Pairing two superior technologies is sure to yield a uniformly exceptional product. The Ultima™ CardiO2® gas exchange analysis system is a perfect example. It combines our leading gas-exchange technology with the premier Mortara® ECG. Fast-responding oxygen and carbon dioxide sensors acquire data on a discreet breath-by-breath basis, providing continuous analysis and display of data. A single software platform seamlessly controls both the gas-exchange and ECG components. The fully adjustable desktop allows for expansive personal workspace whether the technician is sitting or standing. The result is an all-in-one, easy-to-use, “gold standard” metabolic stress-testing system. MGC DIAGNOSTICS’ PROPRIETARY BREATH-BY-BREATH TESTING METHOD offers superior breath measurement during both rest and exercise. 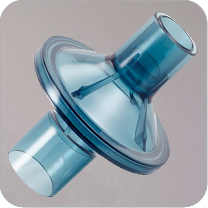 Our preVent® flow sensor offers numerous advantages over other flow devices. The preVent is small, lightweight and comfortable. It can be either cleaned or discarded between patients yet meets all ATS/ERS requirements for accuracy. preVent® flow sensor and preVent® face mask are comfortable and lightweight.